The wildness of the coast with its deep gorges and impenetrable forests, mangrove swamps and the primitive force of freak waves that caused many a shipwreck along this region of the coast, have not quite managed the attempt to tame them by colonial order, since Port St Johns development, in 1878. 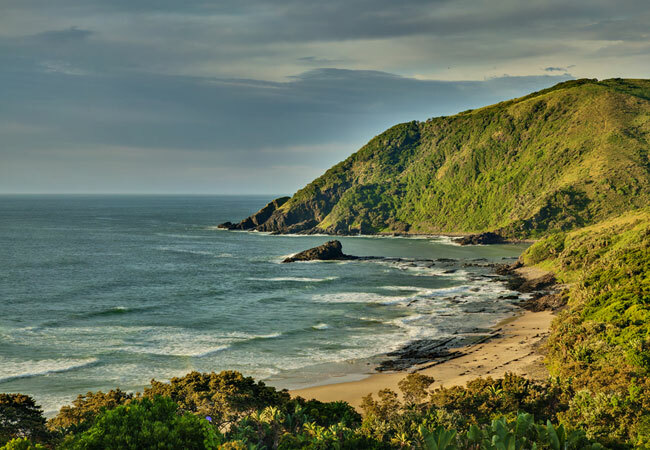 The setting of Port St Johns is possibly the most dramatic in the country and the drive from Umtata to Port St Johns is one of the best journeys on the Wild Coast. The Umzimvubu River cuts a huge gorge right to the sea where it then squeezes between the river’s edge and the red stone cliffs of the gorge. Twin mountains, the Thesiger and Sullivan, lie on either side of the river mouth like bastions and are regarded as the gates of Port St Johns, which, despite this splendour, is largely a magnet for hippies, eccentrics and backpackers. Port St Johns also offers a unique blend of cultural richness. The Xhosa culture, both traditional and modern, is always apparent. You will see a sangoma (traditional healer) strolling along in all his finery, hear the thumping sound of kwaito music from a furniture store, and dodge the ever-present voracious mini-bus taxis. This vibrant noise and colour is contrasted with some crumbling reminders of a colonial history. In the streets you will hear Xhosa, Afrikaans and English as well as foreign languages from the steady stream of tourists seeking the unusual. Dense bush encroaches into the town at any opportunity and a short walk will take you into silent forests. The sea is always close, crashing onto the rocky shores which guard the secluded beaches. forests. This is prime hiking country, with forests and trails and more than 250 species of birds. Other activities in the area include: canoe trips, horse trails, golf, dolphin and whale watching and some excellent fishing. There are a number of ways to arrive in Port St Johns. The 133 bends in the road from Lusikisiki is a popular choice. However, walking from Port Edward along the beach, hills and cliffs is definitely the best way. It’s quite easy actually – all you do is go down to the beach at the Wildcoast Casino and keep walking. It’s a natural extension of the KZN South Coast. Walking gives one a unique perspective.